There are also two special archives - National Archives in Prague where jewish registries are stored and Military Historical Archives which stores military registries. covers the area of the capital city Prague. It had about 200 thousands inhabitants in 1869 and 700 thousands in 1921 and the number was dynamically growing year to year. Searching your ancestors in Prague could be very complicated if the only thing you know is that they were born in "Prague". 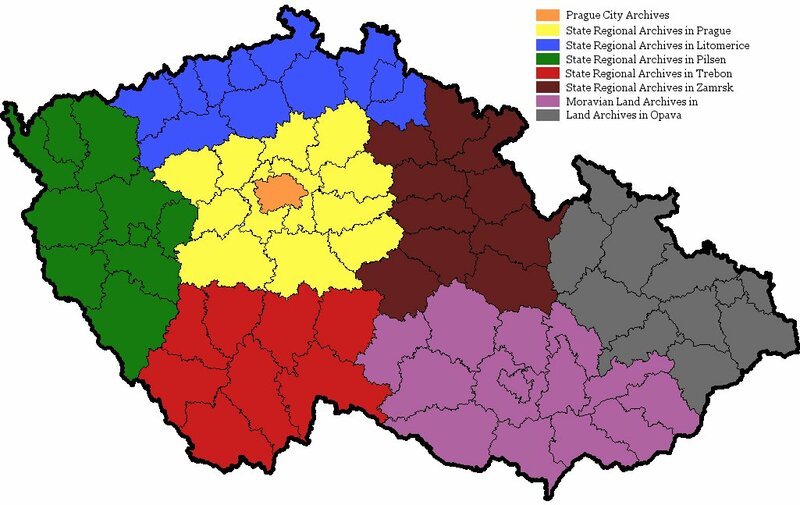 Inner Prague had about 30 parishes, outer Prague had 39 parishes. I think you can imagine what would it mean to search each parish... As this is only an overview we will return to Prague Archives in future and go deeper. covers central Bohemia, districts of Benesov, Beroun, Kladno, Kolín, Kutná Hora, Melnik, Mlada Boleslav, Nymburk, Prague-west, Prague-east, Pribram and Rakovnik. The archives is located in the same object as the Prague City Archives, but the archives are two different organisations. covers northern and part of western Bohemia. You can find parish books from districts Ceska Lipa, Chomutov, Decin, Jablonec nad Nisou, Liberec, Litomerice, Louny, Most, Semily, Teplice and Usti nad Labem there. This archives cover large part of Sudetenland where native German people lived until the end of WWII. Archives building is located in the center of Litomerice. covers western Bohemia, districts Cheb, Domazlice, Karlovy Vary, Klatovy, Pilsen (town), Pilsen-south, Pilsen-north, Rokycany, Sokolov and Tachov. Quite many people immigrated to U.S. from the Pilsen area (as shows the fact that a part of Chicago was called Pilsen). Archives is located near to the Pilsen centre. covers southern Bohemia and part of Vysocina region. The districts covered by this archives are: Ceske Budejovice, Cesky Krumlov, Jindrichuv Hradec, Pelhrimov, Pisek, Strakonice and Tabor. There were quite many Germans living in the Ceske Budejovice, Cesky Krumlov and Jindrichuv Hradec region before the resettlement of Germans after the WWII. The archives is located in the beautiful Trebon chateau. covers eastern Bohemia and part of Vysocina region. Districts covered are: Chrudim, Havlickuv Brod, Hradec Kralove, Jicin, Nachod, Pardubice, Rychnov nad Kneznou, Svitavy, Trutnov and Usti nad Orlici. The archives is located in chateau in small village in eastern Bohemia. covers southern and central Moravia, parts of Vysocina region and eastern Moravia, district Blansko, Breclav, Brno-town, Brno-surroundings (venkov), Hodonin, Jihlava, Kromeriz, Prostejov, Trebic, Uherske Hradiste, Vyskov, Zdar nad Sazavou, Zlin and Znojmo. The archives is situated near Brno campus in very modern building. covers northern and part of eastern Moravia and whole Czech part of Silesia, districts Bruntal, Frydek-Mistek, Jesenik, Karvina, Novy Jicin, Olomouc, Opava, Ostrava, Prerov, Sumperk and Vsetin. Archives is located in the old part of Opava town, which lies near to the Polish borders. Are the Trebon Archives on line? I am looking for my Great Grandmother Anna Ondra, who came to America in 1894. My Bohemian ancestors were from the village of Rosshaupt/Rozvadov. What records can I find online for that area? Hi, Rozvadov doesn't have records online yet - it belongs under Pilsen archives and it should be published in about year or year and a half. I was curious if records still exist for Chudenin (Chudiwa) and if they are available online? I had relatives on my paternal grandmother's side of the family that resided their until after the second world war. They were ethnic Germans. Any idea when the records from Romerstadt / Rymarov will be online? I'n interested in records of Uittwa. WQould you be so kind that where can I find it? Anyone know why the census records for Cheb are not online on the Pilzen archive portia fontium site? my family came from • Kladno, Central Bohemia, Czech Republic How do I go about finding records for them? Join the Czech Genealogy FaceBook page and ask the question there. I found a Vaclav but about 6 months off from the date you supplied. The members of the page would be glad to help.